Biocatalysis is catalysis in living (biological) systems. In biocatalytic processes, natural catalysts, such as protein enzymes, perform chemical transformations on organic compounds. Both enzymes that have been more or less isolated and enzymes still residing inside living cells are employed for this task. Nature has engineered enzymes to catalyse nature itself. Enzymes are used to produce drugs as an alternative to the chemical synthesis to reduce cost, to improve stereo selectivity, overcome practical concerns like high temperature and pressure and to make the process eco-friendly. Designer enzymes mimicking evolution on a laboratory timescale is the trend in the global enzyme market. The starting point will usually be a product, which can perhaps be produced by one of several possible biocatalytic reactions that convert suitable substrates to the desired product. 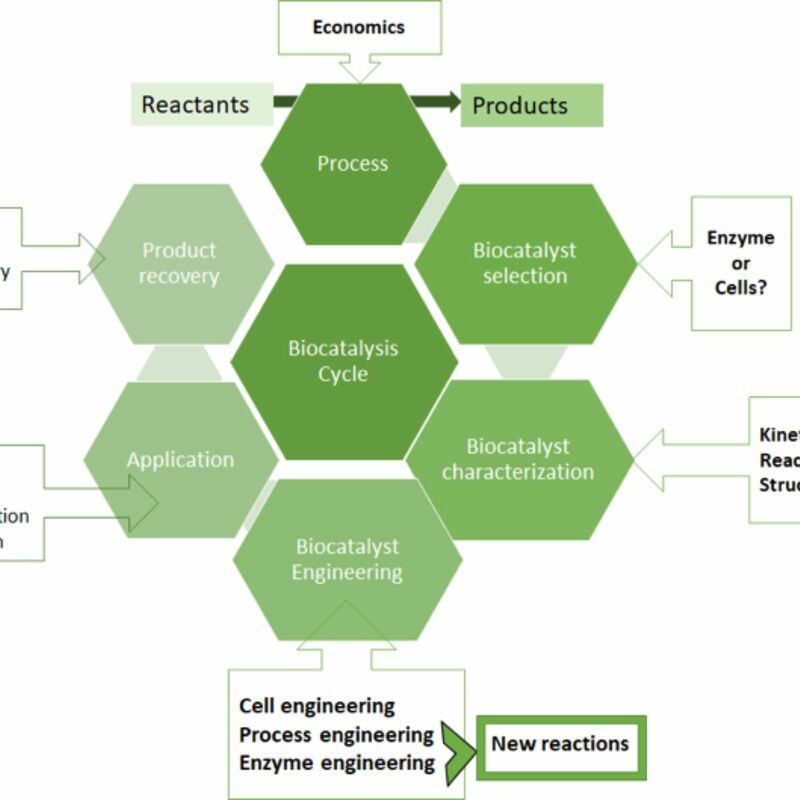 One or more biocatalysts must be identified or developed, a process must be set up, and the resulting bioconversion will ultimately have to be economically feasible. The development of such a process requires the input of many different specialists. Limiting aspects of the biocatalytic process are improved in an iterative manner, gradually leading to an efficient industrial process. Traditional biocatalysis, natural products are converted into other natural products using natural reactions and pathways, for example bread and cheese making, leather processing, beer and wine fermentation, and natural antibiotic production. Broad-substrate-range biocatalysis , chemical intermediates (non natural products) are converted into other chemical intermediates using natural reactions and pathways, example manufacture of pharmaceutical intermediates using lipases and carbonyl reductases (alcohol dehydrogenases). Multistep biocatalysis, natural products are converted into fuels, materials and chemical feed stocks (non-natural products) using non natural reactions and pathways, example fuel molecules created using the isoprene biosynthesis pathways, amino-acid biosynthesis diverted to fuel alcohols. Posted 12 months ago by Quantumzyme. Quantumzyme is a boutique enzyme engineering company focused on application of Quantum Mechanics, Molecular Modelling and Molecular Dynamics simulations to understand catalysis and provides the ability to rationalise suitable modifications to achieve the maximum benefit of biotransformation. © 2019 Quantumzyme LLP | All Right Reserved.